The Gritzy Caves, a place in Mario & Luigi: Partners in Time, is a series of caverns directly beneath the Koopaseum within the Gritzy Desert. Petey Piranha was found here during the course of the game. The cavern has bluish stone and a sandy floor. Additionally, the walls are covered with vines and rock formations that resemble the heads of Piranha Plants. There are also many openings in the ceiling, allowing light in, however the cavern is mostly dim. Dark Boos, Elite Boom Guys, and Snifaros are enemies in this area. There are also Monty Moles, as well, two of which run an Item Shop called the Monty Mart. The battle with Petey Piranha in Mario & Luigi: Partners in Time. 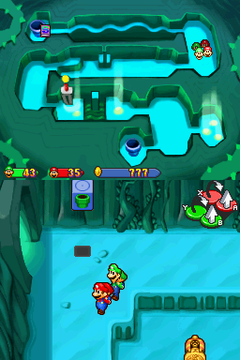 Mario, Luigi, Baby Mario, and Baby Luigi enter the Gritzy Caves through the floor of the Koopaseum. 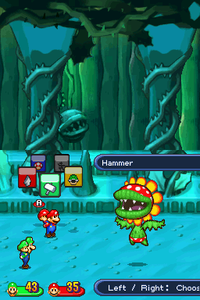 A group of Shroobs carrying hammers surround them. They then strike the ground, making a hole which the Mario Bros. fall in. Soon afterwards, they encounter Kylie Koopa and a couple of Shroobs, only to see her fed to Petey Piranha who, earlier, had also eaten Princess Peach. But before the Mario Bros. can do anything, Petey Piranha burrowed away. After traveling through the cavern, the Mario Bros. finally battle Petey Piranha. Once defeated, he explodes and both Kylie and a Cobalt Star Shard fly out of him, but Princess Peach does not. Kylie explains that when she was eaten she saw the princess, however, Petey spat her out right after swallowing Kylie. The Mario Bros. proceed a little further to reach a dead end where they encounter "Peach" with a Shroob Mushroom on her face, which leads to them returning to the Mushroom Kingdom's present time. Ultra Mushroom Two are in the green block in the west high platform in the fourth scene in the second area. Super Drop Two are in the northeast ? Block in the scene to the east of the seventh scene in the second area. Ultra Drop In the red block in the northeast of the northeast scene in the first area. In the green block above the platform in the scene to the east of the seventh scene in the second area. Red Pepper Two are in the ? Block in the northwest of the cave behind the north scene in the first area. In the north ? Block in the east high platform in the fourth scene in the second area. Green Pepper Two are in the green block in the southeast of the cave behind the north scene in the first area. Green Shell Three are in the ? Block in the center of the fifth scene in the second area. Three are in the ? Block in the southeast of the second scene in the third area. Bro Flower Two are in the ? Block in the west of the east scene in the first area. Five are in the red block in the east of the fourth scene in the second area. Two are in the north ? Block in the seventh scene in the second area. Three are in the ? Block in the southwest of the second scene in the third area. Cannonballer Three are in the right ? Block in the south of the fourth scene in the second area. Smash Egg Three are in the ? Block in the south of the north scene of the first area. Pocket Chomp Two are in the ? Block in the cave behind the second scene in the second area. Three are in the ? Block in the northeast of the second scene in the third area. Trampoline Five are in the red block in the southwest of the north scene of the first area. Two are in the left ? Block in the cave behind the east scene in the first area. Three are in the ? Block in the south of the center-west scene in the first area. Three are in the ? Block in the northwest of the second scene in the third area. Dire-Free Badge In the left green block in the cave behind the center-west scene in the first area. Big-DEF Badge In the left red block in the middle of the second scene in the second area. Big-POW Badge In the red block in the east high platform in the fourth scene in the second area. Bean Near the south pipe in the northeast scene in the first area. In the southeast of the east scene in the first area. In the southwest of the southeast scene in the first area. In the northwest platform in the center-west scene in the first area. In the cave behind the center-west scene in the first area. In the northeast of the third scene in the second area. In the southwest of the third scene in the second area. In the east of the fifth scene in the second area. In the southwest of the fifth scene in the second area. In the west of the cave behind the sixth scene in the second area. In the northeast of the seventh scene in the second area. In the northeast of the second scene in the third area. Like many underground locations throughout the franchise, the music for Gritzy Caves is an arrangement of the underground theme from the original Super Mario Bros. This page was last edited on December 18, 2018, at 01:42.